Packard's 9000 Series 200/300 Workstations. The interface can be used Windows 2000, Windows XP Professional, Windows Vista, Windows 7 and Linux. 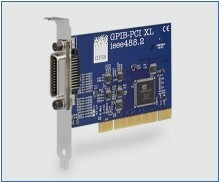 The driver supports the industry standard GPIB-32.DLL (National Instruments compatible). In an alternate configuration mode the interface is also compatible to the Agilent SICL/VISA library. The Ines GPIB-PCI-E interface is fully compatible with the HPIB interface found on Hewlett Packards 9000 Series 200/300 Workstations when using under HTBasic (Windows version).